Console gaming is easy as you already have your platform set up for you. Aside from being easy to run, other benefits of console gaming include access to exclusive titles and other hardware. That’s not to say that console gaming is far superior from PC gaming. If you have the budget and the technical know-how, you can create a gaming experience unlike any other. If you are building a gaming PC, there are a lot of things to consider including the graphics card, the processor, and which hardware is best for you. You’ll also have to choose what type of storage component you’ll equip your PC with. It will boil down to a choice between an SSD or an HDD. Each has its own merits and downsides but before we dive into what these are, let’s first understand what each is respectively. A hard disk drive or HDD is a physical storage device that is responsible for the reading and writing of the hard disk. Despite being introduced way back in the 1950s, HDDs are still pretty common today and it can be found in computers, smartphones, gaming consoles, and other consumer electronics. It is also the foundation of other forms of storage devices. HDDs are comprised of several moving parts which include disk platters, sealed chambers, head arms, readers and more. These small parts make up a solid machine that can perform data tasks within computers. One downside to HDDs is that the individual parts can break. Luckily, some of these parts can be replaced so you don’t always have to buy a new one. HDDs can work well for gaming but it has to reach a few standards first. First off, it should at least have enough capacity to have many games in its storage. Ideally, the average size is around 525GB. It should also be fast enough to support a game’s graphics. However, it does not do much in terms of other factors such as loading times and performance. A solid-state drive, better known as an SSD is a storage device that accomplishes its task via integrated circuit assemblies as a form of memory. Because of how it is meant to perform, SSDs are able to store data persistently. SSDs are primarily made up of two components, a flash controller and NAND flash memory chips. One of the pros of SSDs is that it is able to deliver high read and write performance for various data requests. It is also one of the latest innovations in storage technology after being founded in the 90s. SSDs are also more energy efficient as there are no moving parts to keep it up and running. Aside from that, it is also more durable than HDDs. In gaming, SSDs are meant to drastically boost the performance of games. We’re not talking about graphical upgrades. Instead, it boosts games in a way that allows them to load faster. Since it has faster data transfer speeds compared to HDDs, it can shorten load times, reduce the hitch in various games, and it could generally improve the performance of your PC. Now that you have a full understanding of what SSDs and HDDs are, it’s now time to see which of the two will be perfect for your gaming PC. Building a PC is no easy feat as you need a lot of knowledge to do so. It’s also a rather expensive venture as graphics cards alone can set you back a thousand dollars. Gamers often have to choose between SSDs and HDDs when building their PCs and the choice often results in them picking the former. A lot of gamers believe that SSDs can improve the performance of video games running on PCs. That is true in a sense but the term “performance” is broad. Many SSD users believe that the device can greatly improve framerates but that is not the case. Framerates can only be improved through GPUs. Regardless of how big your SSD storage is, your games will look the same through and through. Where it does shine most is in boot times. It can be a lot of effort to test out but you’ll see a big difference in the boot times for games installed on an SSD over games installed on a PC’s built-in storage. If your SSD is top-tier, the boot time could be reduced by more than half the usual time but that’s not all. Aside from boot times, SSDs can greatly improve the loading time in the games themselves. Let’s say you’re playing a game like The Elder Scrolls V: Skyrim. You’re on a fetch quest that takes you around the entire game map but to save time, you use fast travel. Each time you fast travel, you’ll encounter a loading screen. Skyrim is notorious for having long loading screens but if you have an SSD installed, these will come by a lot faster. The better your SSD, the shorter the loading time. Now, HDDs can do the same for your gaming PC. It can shorten loading times and boot times as well. However, SSDs are better at the task generally. Another big difference is that SSDs produce a more significant upgrade to boot times as compared to HDDs. From this alone, it’s pretty obvious that SSDs are the better piece for a gaming PC. Since SSDs improve your entire PCs performance and not just your games, then you can experience faster loading times on your other applications and programs. That isn’t to say that there aren’t any downsides to SSDs. If you are on a budget, then SSDs may not be the best option as these are more expensive per GB compared to HDDs. Generally speaking, SSDs will cost you around $0.20 per GB whereas HDDs will only cost you $0.03 per GB. This is where it might get tricky though as while HDDs are cheaper, they consume more power than SDDs. Moreover, since HDDs contain moving parts, your PC might experience weak to moderate vibrations from time to time. As we’ve stated before, the moving parts could break. Since SDDs have no moving parts, they are generally more easy to take care of. In fact, you’ll only want to avoid damaging the internal parts of it. It is also worth noting that HDDs usually have higher storage capacity. SSDs typically have 1 to 4TB storage even if it’s high-end. On the other hand, an HDDs’ storage capacity can range from 2 to 10TB. That basically means good news for you if you have many games in your library. 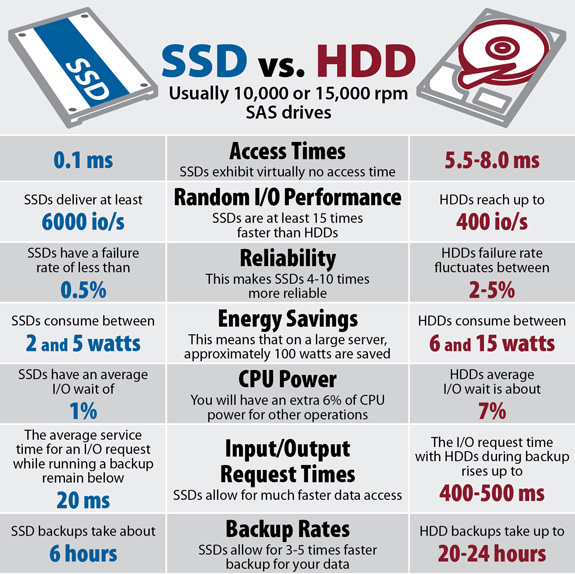 The choice between HDDs and SSDs all boil down to what you need and what you can buy. If you want to boost the overall boot time of your PC and games, the SSDs are the best option for you. While expensive, there is a significant boost in loading and boot times that generally improve the user experience. If you want to have more games on your PC, then we suggest investing in a huge capacity HDD. While it has slower boot and load times, the amount of games and other files you can store on a 10TB HDD is just too hard to pass up. All you need to have is a little patience with HDDs and you are good to go. If you’re looking for a significant upgrade on your game’s performance, we suggest buying at least a 1TB HDD. You should then invest your money on high-end GPUs and audio cards instead. Having a small storage space is not that big of a problem as you can simply install and uninstall games when the storage gets to full. Not everyone has the budget for this but if you do, you can have an HDD and SSD at the same time. Not surprisingly, a lot of gamers make this approach as it is the most cost-efficient. You can install a 500GB SSD in your PC which you’ll use as a system drive for the games you need. Of course, these games will get the benefit of booting up faster. For your other data, you can buy a 1TB HDD for storage. If you have the time, you can simply move your SSD games into your HDD and vice versa. In doing so, you are able to get better load times for the games you are currently playing while keeping your completed games still installed on your PC via the HDD. If you are still unsure of what’s best for you, it’s better if you ask help from your friend who knows what he’s doing. You can also inquire from the personnel in attendance at the place where you’ll be buying your PC parts. Building your gaming PC is expensive and tiresome but trust us, you’ll be very satisfied when you do things right. As a budget gamer, your best option is to weight out your individual hardware so you can be more cost-efficient. SSDs and HDDs are just a small portion of your PC so don’t waste all your budget on these drives.